Description: Early Jewish Literature: An Anthology offers more than seventy selections from Second Temple-era Jewish literature, each introduced and translated by a leading scholar in the field. Organized by genre, this two-volume anthology presents both complete works and substantial excerpts of longer works, giving readers a solid introduction to the major works of the era�the Dead Sea Scrolls, the Old Testament Pseudepigrapha, the writings of Josephus and Philo of Alexandria, and the Septuagint (Apocrypha). The substantive introduction to each selection includes these elements: narrative description; author/provenance; date/occasion; text, language, sources, and transmission; theology; and reception during the Second Temple period. Additional student aids include a list of further readings on each selection, a section of maps, a glossary of biographical names, and a glossary of terms. With contributors and translators including such noted scholars as James Charlesworth, Sidnie White Crawford, James D. G. Dunn, Peter W. Flint, and James VanderKam, this anthology will be an essential resource for all students of early Jewish literature and emerging Christian traditions. 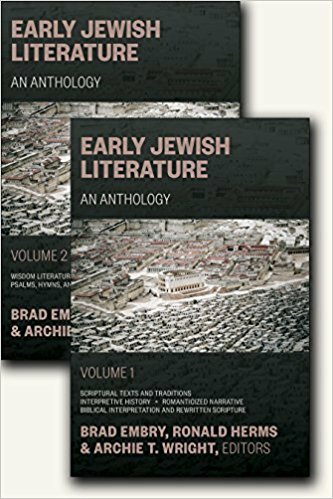 Citation: Lester Grabbe, review of Brad Embry, Ronald Herms, and Archie T. Wright, eds., Early Jewish Literature: An Anthology, Review of Biblical Literature [http://www.bookreviews.org] (2019).